Stapling heads are reversible for stapling the smallest header cards (3.5" wide) while holding materials in one hand! Fully adjustable center distances between staples from 2" to 7.25"
Model S-620NHL Double Header Electric Stapler - Now with "pop-out" front loading and foot-switch ready! Drives two staples at once automatically when work is inserted! A Staplex exclusive! Independent ON/OFF switch for each stapling head to operate also as a single head stapler! Optional Footswitch and Adjustable Backstop Set Available. Model S-620NHL includes automatic contact assembly that activates when material hits microswitch on the right side of the right stapling head– requires a minimum 3/4” distance from right edge of material to the right leg of the right staple to activate microswitch. Now with "pop-out front loading! Drives two staples at once automatically! A Staplex exclusive! Fully adjustable center distances between staples from 2" to 6.5"
Uses Staplex Type RLD "Thick Wire Staples"
Drives three staples at once automatically ! 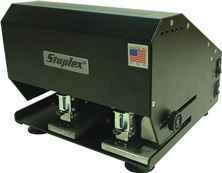 Super speedy for many stapling and packaging applications! Completely portable. No mounting required. Weight: 26‑¼ lbs. Dimensions: 9-7/8" wide, 9¾" deep, 7¾" high. NOTE: Footswitch activated Models have adjustable center distances between staples from 2" to 3.75, up to 7½" outer distance.